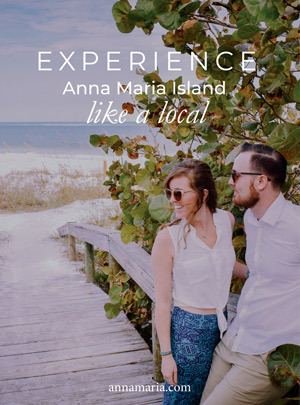 Anna Maria Island is an ecologically diverse barrier island and an important habitat for an incredible array of wildlife including dolphins, sea turtles, crabs, manatees, a vast range of migrating and local bird species, fish, and even racoons, geckos and small lizards in abundance. And, although you probably have heard of Florida alligators, you can safely explore the parks, marshes, beaches and coastal regions of Anna Maria Island without worry about encountering them. They prefer fresh water and thankfully aren’t found around Anna Maria Island, although they tend to be shy creatures and mostly avoid humans. 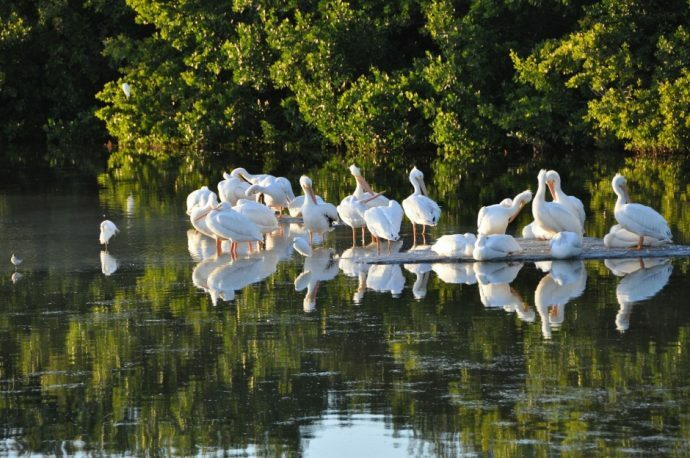 Anna Maria Island draws bird enthusiasts from all over the world, as it is a major migration point and a crucial nesting habitat for both common and rare shorebird, seabird and land bird species. Some of the best bird watching can be enjoyed at the many beaches throughout the island where you can get a glimpse of herons, sandpipers, osprey, pelicans, cranes, vultures, hawks, crows, eagles, seagulls, storks, skimmers, egrets and spoonbills. During various times of the day you’ll get to see different species of shorebirds, as some of them feed during low tide or high tide. The Coquina Beach Baywalk on the southern end of the island, in particular, is one of the best places for bird watching, as well as Bean Point on the northern end of the island. As you might expect there are hundreds of marine life species in the Gulf waters around Anna Maria Island, making it one of the best fishing destinations in all of Florida. Marine species that thrive here include a wide range of shark species, jellyfish, sea turtles, stingrays, and several types of fish such as mackerel, snook, trout, amberjack, redfish, snapper, grouper, mahi, hogfish, cobia, sheepshead and many others depending on the particular ocean location. When it comes to seeing the local fish species, you can take a fishing charter where you can catch and release several types under the supervision of experienced fishermen, or there are plenty of snorkeling and scuba diving tours available as well. Purple flags are used to notify swimmers of any potentially dangerous ocean marine life in the area, so keep an eye out when swimming or snorkeling! Dolphins make the waters around Anna Maria Island their home throughout the year, and dolphin and whale watching tours are a very popular activity to participate in. These cruises will take you around Anna Maria Island where you can see pods of bottlenose dolphins playing and swimming about in their natural habitat. The tours do not disturb the dolphins and are a perfect way to guarantee that you’ll see them during your Anna Maria Island vacation. You may also be able to spot them from the beach or piers of the island. Depending on the time of year, you can also see stingrays and manatees along with many of the bird species mentioned above during your ocean adventure. 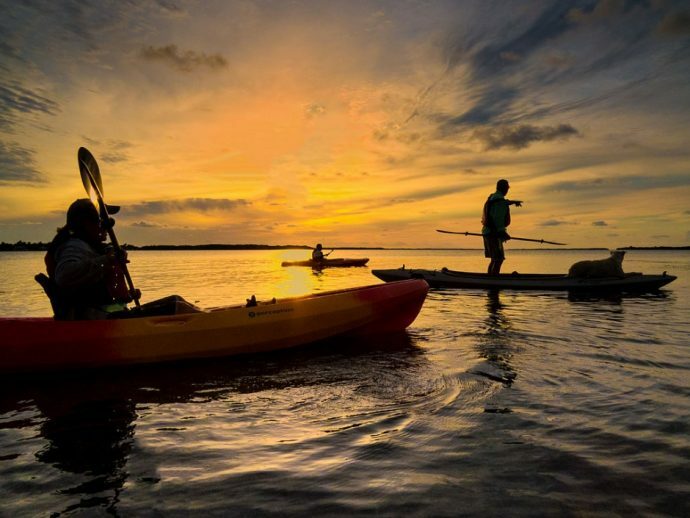 Local kayaking tours are another ideal way to see dolphins and other marine life species along with remarkable native plants such as mangrove trees. No matter what type of wildlife tour you choose, you’re sure to have a unique and memorable experience on Anna Maria Island, so be sure to fill your schedule up!